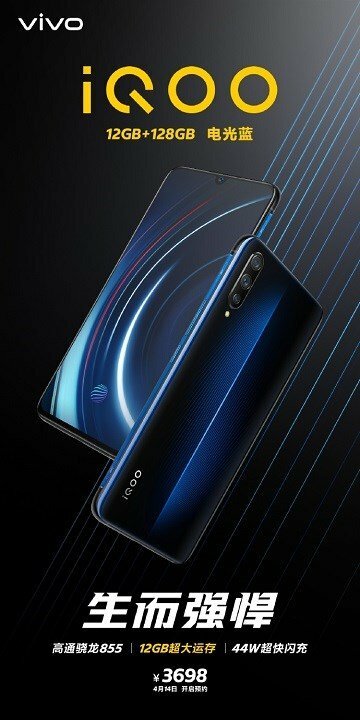 Vivo the trendy Chinese Mobile company has rolled out new variant of Vivo iQOO. They have launched 12 GB RAM + 128 GB storage version. Going by the current trends 12GB RAM is massive by any standards. This clearly reflects on the target segment that the phone is aimed at. With such huge RAM the multi-tasking will be a breeze. Not only that , heavy media consumption like 4K videos and ultra high gaming will also work seamlessly with 12GB. The color being offered is Electro-optical Blue. This looks to be a trendy color with hues of Blue & Black merges in electrifying combination. The other standard features of lower versions remains the same. 6.41 inch screen with 1080 X 2340 pixels. Rear Camera being 13 MP + 12 MP + 2 MP. Front or Selfie camera being 12 MP. We have some doubts that this phone will be offered soon at Indian market. Being priced at Rs.38000 approximately in China, it will cost more after all the import duties & taxes. That makes it a bit over priced for Indian price sensitive consumers.